• Emergency button, Do not disturb, Follow-me etc. 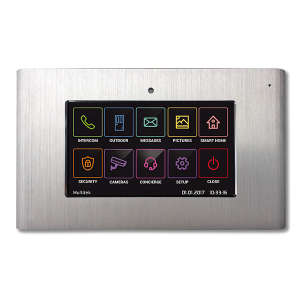 With an easy to navigate user interface and icon style GUI, the VIP72 is designed for the apartment or office to view and control visitors to the building. 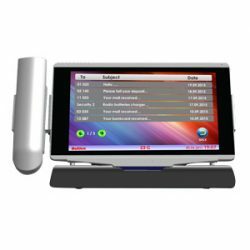 The interactive touch screen activates many functions which include: video calling, phone book, camera view (up to 9 security cameras), contact security or reception, emergency call, SMS messaging (between devices), alarm clock. Along with displaying the date, time and temperature. The VIP72 includes a surface mount frame made from high quality aluminium. 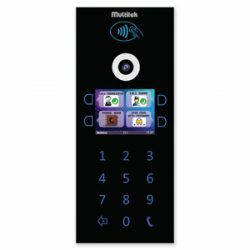 All devices connect to the network easily, the installation and maintenance of the intercom system does not require any special training, device or computer. All devices can be configured and updated via service management software.